Texas House of Representatives, 35th Legislature, 1917–1919. 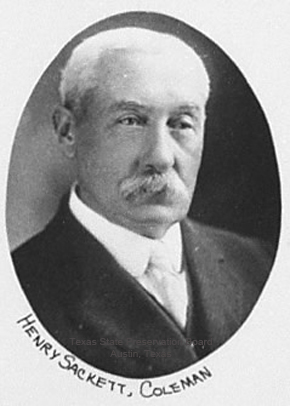 Texas House of Representatives, 34th Legislature, 1915–1917. Texas House of Representatives, 36th Legislature, 1919–1921. Texas House of Representatives, 38th Legislature, 1923–1925. GRO Indexes to Births, 1837 to date, "Mar qtr 1851. 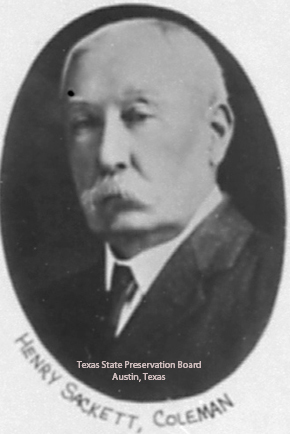 Sackett, Henry. Mother: Rea. Orsett. 12:216." 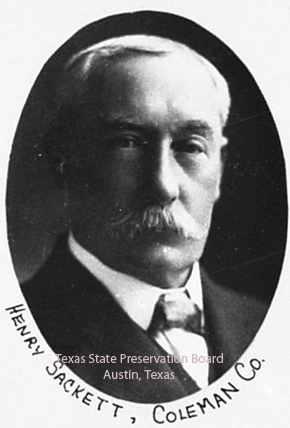 "Texas Death Certificates 1903–1982", digital image, Ancestry.com, "Sackett, Henry, d. Coleman County, Texas, 19 Dec 1928, age 77-9-26, b. Eng, 23 Feb 1851, ret. ranchman, married, father Henry Sackett Sr b. Eng, mother Sushana Rea b. Eng, informant Sid Sackett, Coleman, cause pneumonia, bur. Coleman Cem, 21 Dec 1928." Thurmon King's database, 64827 Henry Sackett. Thurmon King's database, 64834 Mary Anna MacNamara. Coleman Democrat-Voice (Texas), digital image, Find A Grave (www.findagrave.com), Mary (MacNamara) Sackett, obituary. Eliza Ann Oakley[? ], serv., unmarried, 17, nursemaid, b. Essex, Orsett. Sacket, Henry, pupil, 10, scholar, b. Orsett, Essex. "New York Passenger Lists, 1820–1957", digital image, Ancestry.com, "Henry Sackett, age 21, arr. New York, 15 Mar 1870, from Liverpool, England, ship City of Washington." 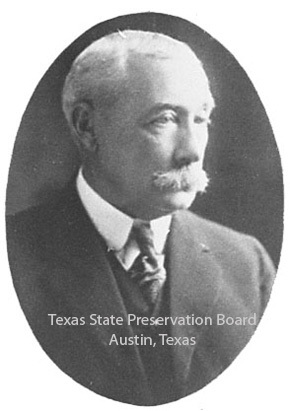 Website Texas State Historical Association (https://tshaonline.org/), citing Beatrice Grady Gay, "Camp Colorado," Handbook of Texas Online. Noble, Joseph, 22, boarder, laborer, b. AR, father b. IL, mother b. IL. Fort Worth Daily Gazette (Texas), digital image, Library of Congress, Chronicling America (http://chroniclingamerica.loc.gov/). Fort Worth Daily Gazette (Texas), digital image, Library of Congress, Chronicling America (http://chroniclingamerica.loc.gov/), September 20, 1894, p. 8, col. 2. "PERSONAL MENTION…Henry Sackett came in last night from Camp. Colo., and registered at the Pickwick." 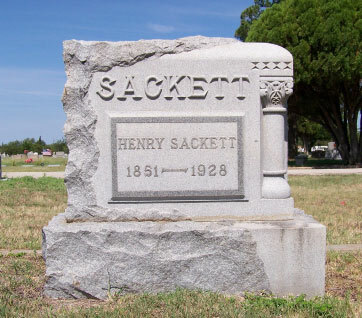 Sackett, Henry, head, b. Jan 1851, 49, m. 22y, immigrated 1870, res. US 30y, merchant, home (farm) owned free of mortgage (marginal note "farm temp"), b. England, father b. England, mother b. England. Website Legislative Reference Library of Texas (http://www.lrl.state.tx.us/), Texas House of Representatives, 33rd Legislature, 2nd C.S. – Oaths of Office Administered, Henry Sackett, 11 Sep 1914, p. 165. Coulson, Maud, dau, 49, m. at 20, b. TX, father b. TX, mother b. US.